Ida May Park in Photoplay. Virtually forgotten today, Los Angeles-born Ida May Park earned the distinction of being one of the first women to direct feature films in early Hollywood, as well as write and produce, before being pushed aside as Wall Street money took over film production. Her long career acting on stage enhanced her film career, one in which she focused on creating strong women characters around which stories revolved. Born December 28, 1879, to laborers Charles and Martha Park in Los Angeles, Ida seemed drawn to entertainment at a young age, appearing with the Alcazar Acting Company in San Francisco by 1897, perhaps after her family moved to Sacramento, where her father later served as a postman. Within a few years, Ida became an itinerant actor, performing with troupes around the United States. Ida May Park in Moving Picture World, July 21, 1917. While touring the country Ida met and fell in love with fellow actor Joseph De Grasse, marrying him May 25, 1901 in New York City. The two formed their own acting troupe, appearing opposite each other in Shakespearean productions and occasional contemporary shows. Unlike many of her female stage counterparts at the time, Ida proudly kept her last name for her profession. The couple moved to Burbank a few years later before moving to 1040 E. 47th in 1906, the address at which their son Joseph Paul would be born in 1907. They later lost a child as well. Ida May Park, Las Vegas Daily Optic, Oct. 6, 1906. Finding life on the road difficult with a child, the De Grasses established an acting school in downtown Los Angeles in 1908, with the September 13, 1908, Los Angeles Herald noting their students would appear in supporting roles at the Auditorium and at the Belasco Theatre. Curious and ambitious, Ida found multiple ways to express artistic pursuits, joining the 16-year-old Los Angeles Women’s Orchestra in 1909 and playing trumpet. Looking for steady jobs, the couple joined the young Pathe film organization in 1910, with Park writing scenarios and De Grasse directing movies. For the next few years, they learned the filmmaking business and developed their skills, first with Pathe, and later with Ammex and Lubin. Ida loved working, and detested housework, per later articles, throwing herself wholeheartedly into the entertainment industry. Joseph De Grasse, Las Vegas Daily Optic, Oct. 6, 1906. Universal Feature Film Manufacturing Company took notice of the talented duo, hiring them in 1914 to create pictures for the company. The couple worked as a team, with De Grasse directing and Park writing scripts for everything from one and two-reelers to features, with such stars as Wallace Reid, Dorothy Davenport, and Lon Chaney. Even in motion pictures, the couple formed their own troupe, forming strong bonds with cast and crew. Many of their films focused on strong independent women as protagonists, seeking out success and fulfillment in sometimes unconventional ways. By 1915, De Grasse and Park created films for Universal’s Rex brand, joining Lois Weber and Phillips Smalley, with some of these films starring actress Cleo Madison, who also served as producer. Within a year, Park and De Grasse shared directing responsibilities on their productions, blending their talents in order to ensure their vision ended up on screen. Trade stories indicated that Park wrote and directed 12 films in 1916, some original stories, and others adaptations of popular works at the time. 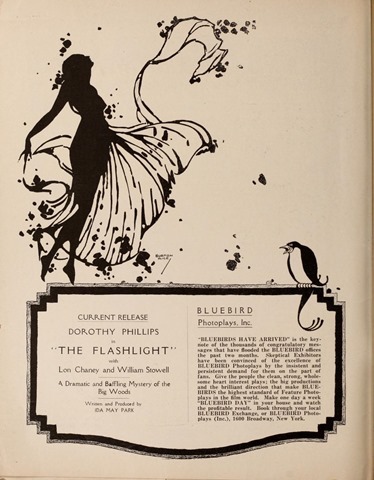 De Grasse and Park began co-directing Dorothy Phillips’ Bluebird films in 1916, all featuring a strong heroine in charge of her destiny, often working jobs. Chaney and William Stowell appeared as Phillips’ co-stars, with Jack Mulhall making some appearances as well. In 1917, Park began directing on her own, with trades noting that the couple could then create twice as many Phillips films to release. Ida gained her first solo directing credit for the 1917 film “The Flashlight” starring Phillips, Chaney, and Stowell, filming on location in the Sierra Nevadas. Moving Picture Weekly, Universal’s own trade magazine, claimed in an article that Park had written more than 100 photoplays before turning her sights to directing, and was one of only two females producing films. Park not only directed, but also wrote and produced her second film, “Fires of Rebellion” that summer, also starring the same three performers. To enhance the story of a woman attempting to escape the drudgery of factory life, Park took her cast to the manufacturing section of downtown Los Angeles along with 100 extras, choreographing fight and crowd scenes. Park’s films featured strong, vital scenes not just romantic melodrama. “The Grand Passion” earned great reviews, with the January 2, 1918 Moving Picture World calling it spectacular and tough, noting it featured “explosive, wild, lustful” realism. Park made films of passionate people, attractive to men or women. A trade noted of the film, “if the name of the director were not known, I would be very likely to say that the direction was the work of a man, so virile is it in its every phase.” Later that year, she directed the film “Bread, which Universal called the sequel to Lois Weber’s earlier film “Shoes,” because it also starred Mary McLaren as a struggling young woman. “The Flashlight,” written and directed by Ida May Park, Moving Picture Weekly, April 28, 1917. Park stated directing also took a sense of humor, firm character, and a strong point of view, but not to take the work too seriously. “Direction is recreation to me, and I want my people to do good work because of their regard for me and not because I browbeat them into it.” The magazine went on to describe how she directed quietly by sometimes demonstrating what she wanted and at other times explaining the situation and allowing the actor to figure it out their own way. Unfortunately some scholars have misread the article and claimed that Park stated that directing was men’s work, but instead it was young E. J. (Elsie Jane) Wilson, another female director, who made this statement, as she focused on her appearance as well. Unfortunately, by 1919, both Park and De Grasse found themselves forced out of Universal in a similar fashion as Weber, struggling to continue their film careers. Wall Street money was flowing into the motion picture industry, and open, freewheeling companies offering opportunities to women as well as men found themselves forced out of business by large companies operating as factories, with men in charge. Women, who had once dominated the writing and editing fields, would soon see most of these opportunities disappear, along with the chance to direct. Park and De Grasse joined Thomas Ince to direct and produce films for actress Louise Glaum in 1919, but this deal appears to have fallen apart. Park wrote and directed “The Butterfly Man” for Lew Cody in 1920, but producer Louis Gasnier gave her no more work. Joseph De Grasse and Ida May Park, Motion Picture News, Oct. 21, 1916. On January 28, 1921, Park addressed the Assistance League of Southern California, speaking about the motion picture industry and women’s role in it. At the same time, fellow directors recognize Park’s talent, as the Motion Picture Directors’ Association elects her to their group in May 1921, only the second women invited to the group, after Lois Weber. Unfortunately the conglomerates taking over the film industry were continuing to turn their backs on women, and Park found little to no opportunity to direct. Soon thereafter, the trades noted that the couple was working on a book about the film industry, but it never appears to have been published. “Bread” by Ida May Park, Los Angeles Herald, Sept. 10, 1918. Sadly, Park found herself unable to hang on in an industry she helped establish, basically retiring to home life at 2459 Laurel Pass Road in Hollywood. She died June 13, 1954, at Hollywood Presbyterian Hospital, 14 years after the death of her husband. Park made a lasting contribution to the early film industry as one of its first writer/director/producers but like Lois Weber found herself written out of the picture by the men who took over the field and rewrote history. Thanks to female scholars the world over, the great accomplishments of people like Alice Guy Blache, Weber, Park, and others is being reintroduced and promoted, recognizing the firsts these women brought to the motion picture industry. This entry was posted in Film, Hollywood, Hollywood Heights, Mary Mallory and tagged #Silent Films, #women's history, film, hollywood, Hollywood Heights, Ida May Park, Mary Mallory. Bookmark the permalink.